Onnellista uutta vuotta! — Καλή Χρονια! — Bonne année! — Frohes neues Jahr! — Un an nou fericit! — Feliĉan novan jaron! — Godt nytt år! — С новым годом! — Срећна нова година! — FELIX SIT ANNUS NOVUS — Gott nytt år! — Щасливого нового року! — ¡Feliz año nuevo! — Gullukkig niuw jaar! — Felice anno nuovo! — عام سعيد — Happy new year! Prettige Kerstdagen! — God Jul! — Crăciun fericit! 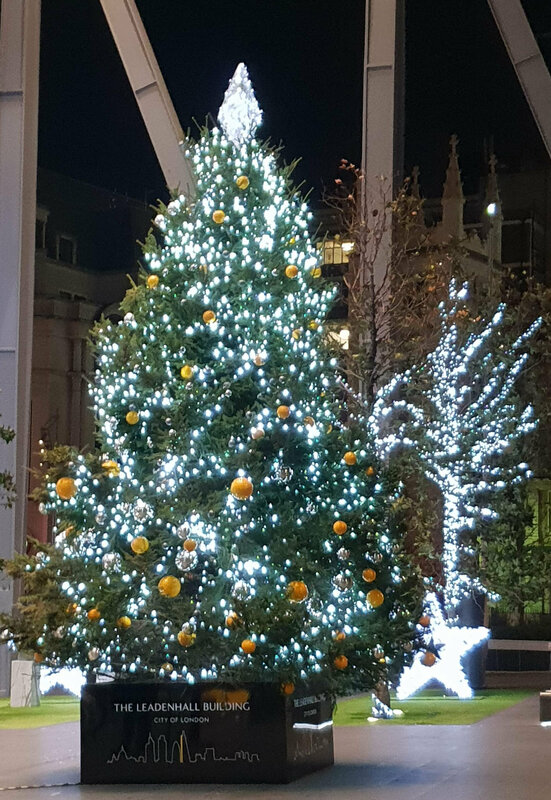 — クリスマスおめでとう ; メリークリスマス — God Jul! — Feliĉan Kristnaskon! — Hyvää Joulua! — ميلاد مجيد — Срећан Божић! — καλά Χριστούγεννα! — З Рiздвом Христовим! — Natale hilare! — Buon Natale! — Joyeux Noël! 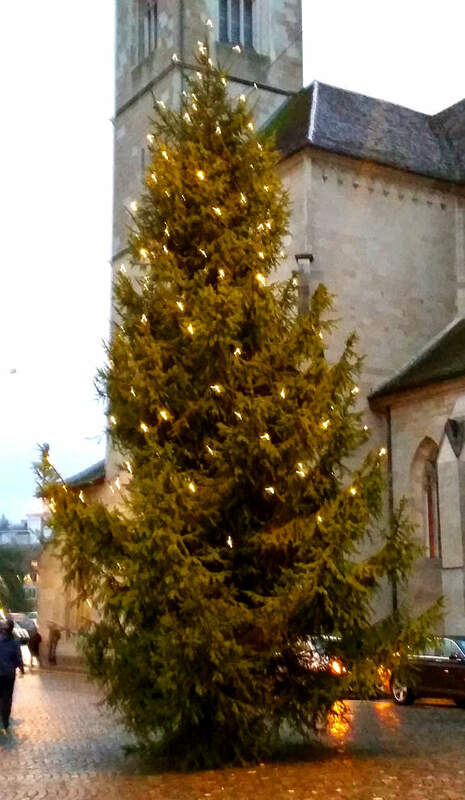 — Frohe Weihnachten! — С Рождеством! — Merry Christmas! — ¡Feliz Navidad! Near Cologne in Germany the Hambach Forest had been occupied by protesters and cleared by the police, in order to promote further destruction of landsacape for the extraction of Lignite. This energy form is just outdated and it is a good idea to get rid of it as soon as possible. Arnold Schwarzenegger brought it to the point in his Video to „Uncle Donald“. What is true for North America, is also true for Europe. Lignite is even worse for the climate than Coal in general and much much worse than natural gas and regenerative energy. All arguments are against using it. But of course the German government has contributed to the heavy overuse of this wrong technology by its forced and hasty nuclear power phase out. 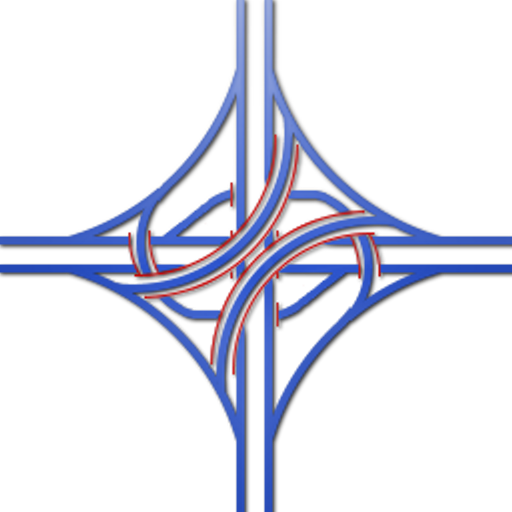 Why do railroads have no cloverleaf interchanges? 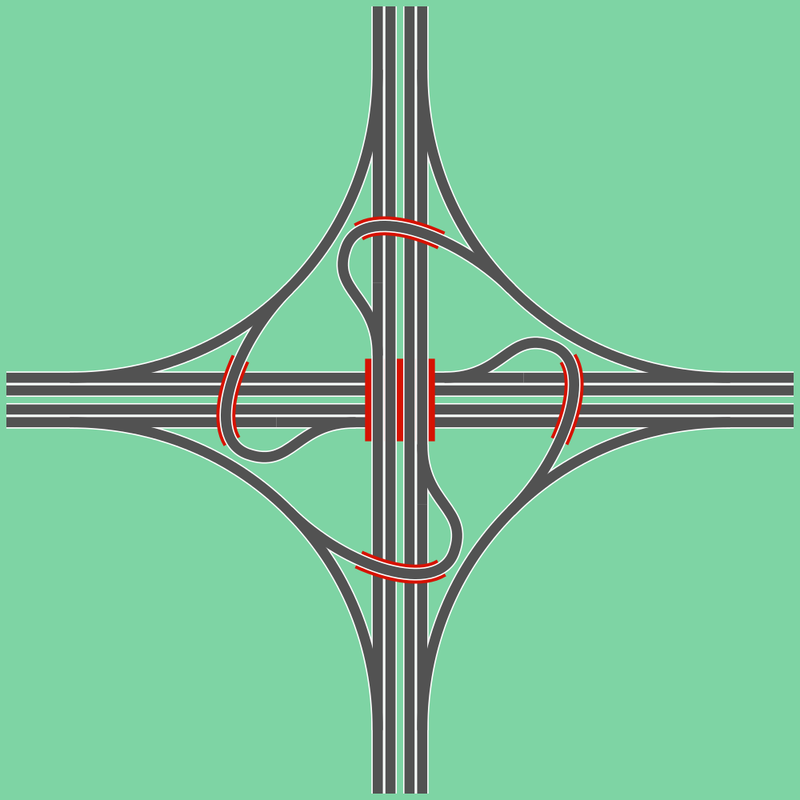 Do cloverleaf interchanges for railroad lines exist? 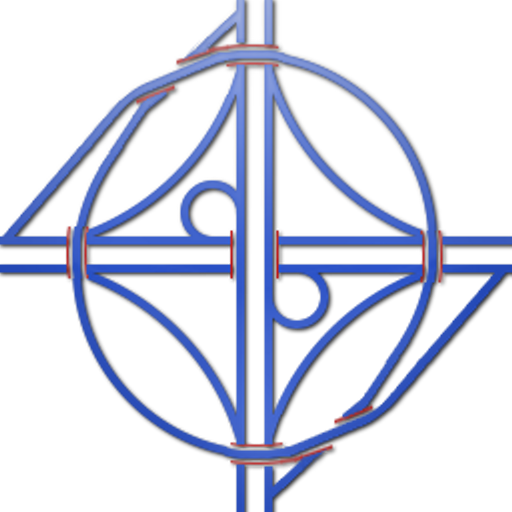 I must admit that I do not know all railroad lines in the world, but I consider it highly unlikely that anywhere two railroad lines are connected by a cloverleaf. They do exist in games that need not be realistic in every aspect, but this page is not focussed on games or model railroads, so we will ignore this from now on. You might ask the railroad companies why, but at least it is highly plausible. 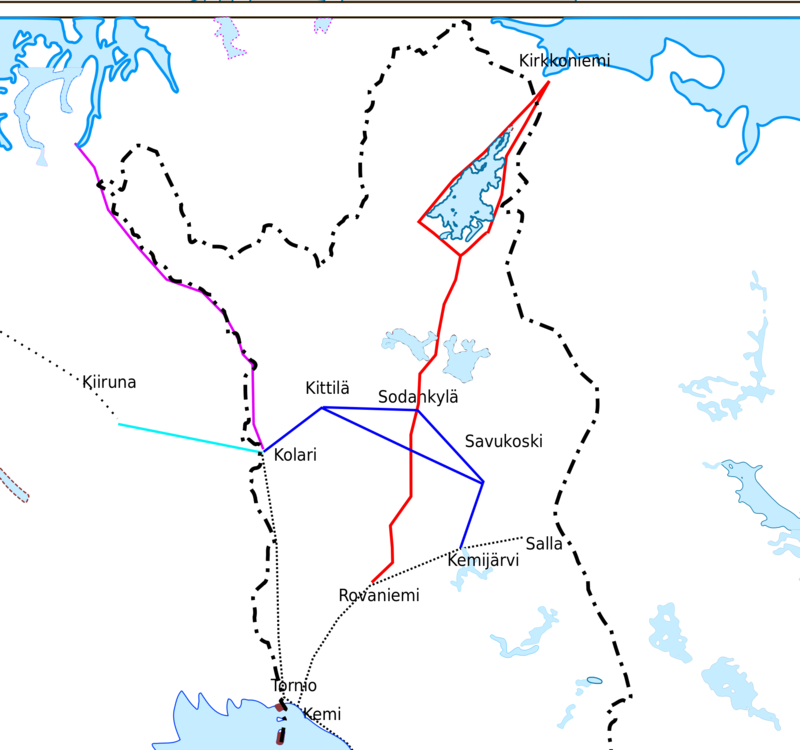 First of all most connections between railroad lines happen in stations. This makes sense for allowing for passengers to change trains and for rearranging freight trains. But there are cases where two rail lines intersect without a major station. Examples that come to my mind are the lines from Darmstadt via Weinheim to Schwetzingen and the line from Mannheim to Heidelberg in Germany that intersect near Mannheim Friedrichsfeld. Or near Zürich were the lines from Wallisellen to Dübendorf and from Stettbach to Dietlikon intersect. 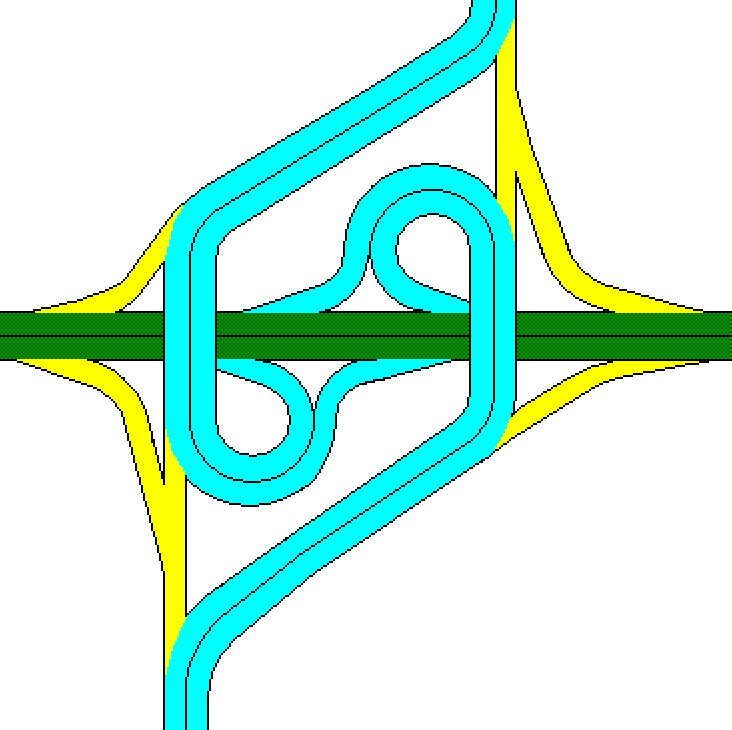 The two main lines intersect using a bridge and then some of the connections are made possible using parially level crossings and partially bridges. The first question is if bridges instead of level crossings are as important for rail as they are for roads. Because the signalling system provides exclusive use of a track to one train, even highspeed tracks may have grade crossings, as long as the switches are built in a way to allow high speed. This does not even slow down the high speed trains during normal operation. The highspeed train gets the track and all other trains have to wait. Schedules are usually made in a way that minimizes such waiting times, so they usually only occur to greater extent if some train is delayed. But if you look how railroad infrastructure has been built it will be obvious that bridges between different tracks are quite common, at least in busy sections of the network. Other than for road transport this is less an issue of speed and security and more an issue of capacity. The bridges allow for more simultaneous train moves and there are less situation in which one train blocks many tracks at the same time mostly near a station. This has been known in the 19th century and a typical construction for a station connecting two rail lines included a bridge for crossing over between the two lines coming from one end. 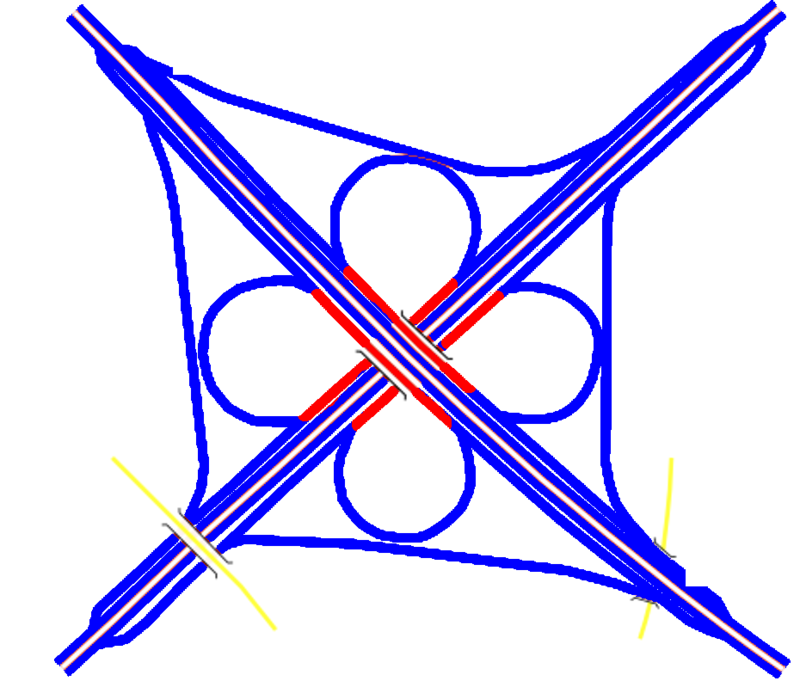 Assuming lines coming from north, east, south and west and a station that is oriented from north west to south east, the lines from the north and the west enter on one side and those from the south and the east from the other side. With this bridge between the lines coming from north and from east the typical setup of trains going from north to south and from east to west allows all four directions to pass simultaneously if the lines are double track. Typically level crossings are only avoided for combinations that are used frequently. Blocking some tracks by rare operations which might even happen during night times is not a priority. 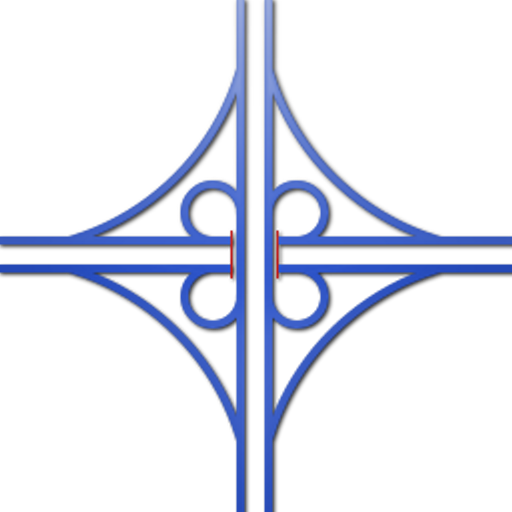 But returning to the cloverleafs: They are not really grade separated and they would use tremendous amounts of space because of the minimal curve radius of railroad tracks. With low traffic densities and traffic consisting of small individual vehicles like bicycles, cars or trucks this works just fine. And a highway that seems to be filled with cars does not really have a very high traffic density because cars are so wasteful with space. As long as the traffic of two neighboring leaves combined is less than the capacity of one lane this can work. Otherwise even for highways other constructions that are really grade free and less space consuming, but more expensive to build seem to be more adequate. Some of them could actually work for railroads as well, because they widely avoid unnecessary curves. Very elegant because it can be built with two levels and is anyway fully grade free. But not good for railroad tracks because of the 270°-bows. 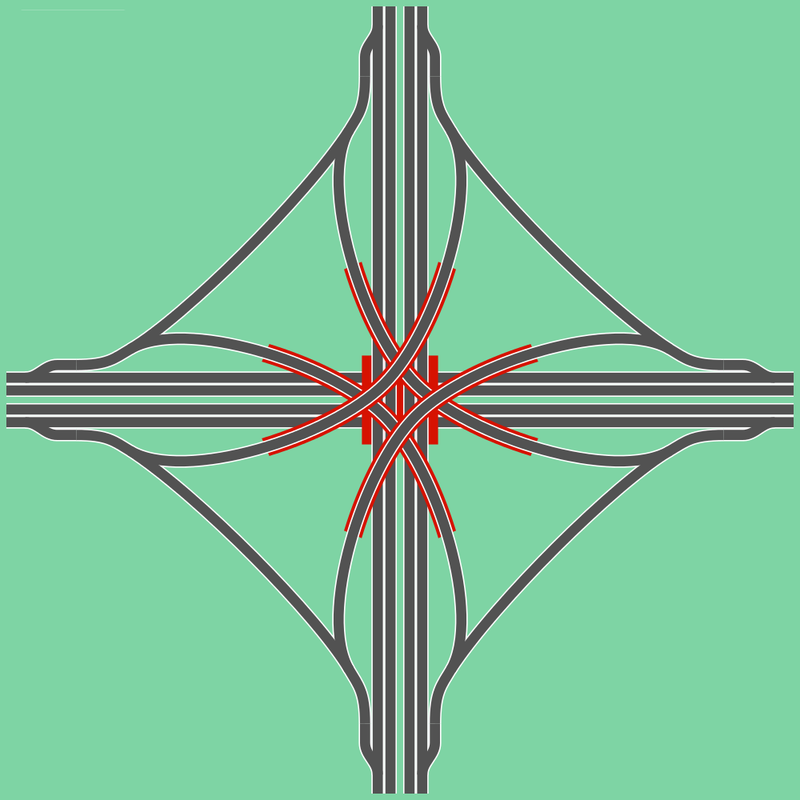 This does not work very well either for more than one roadway per direction. 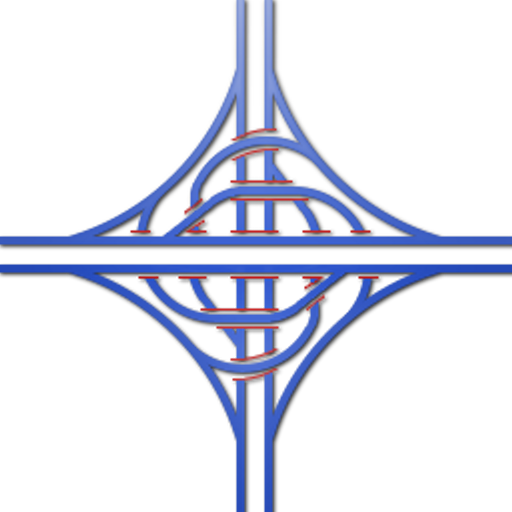 At some point these interchanges grow so high and the ramps for the height differences so long that it would no longer be possible to build this, even with a lot of money. It is very unusual to see such constructions for . 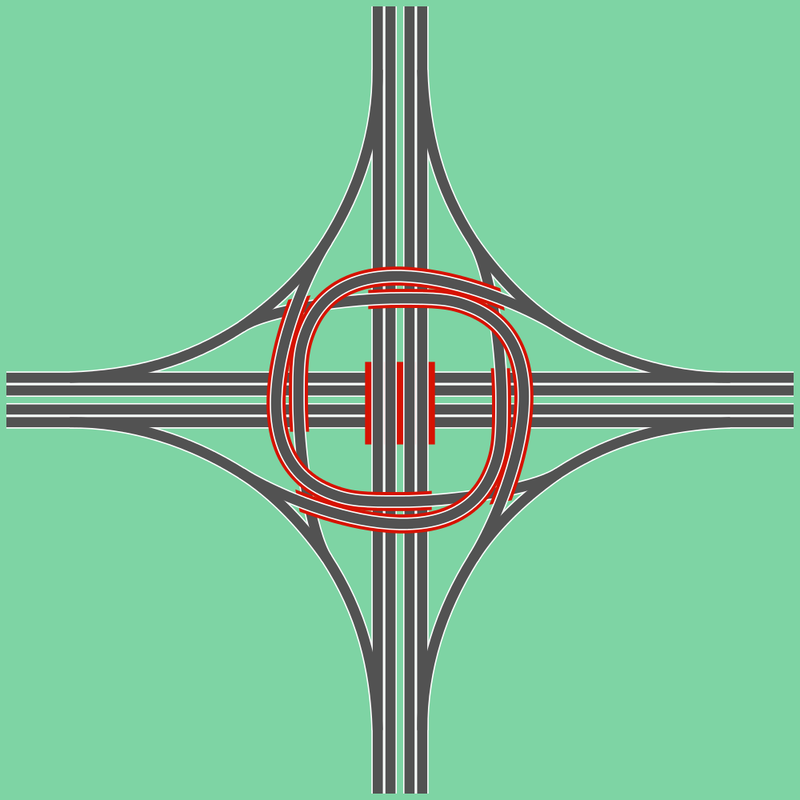 It is absolutely possible to connect any number of throughfares with any number of tracks, roadways bicycle lanes, bus lanes etc. avoiding 270°-bows and using just two levels in a fully grade free way. The idea is very simple and I just describe it for tracks for the sake of simplicity: All tracks have only one direction. The lower level carries tracks running from north to south and vice versa in the vicinity of the interchange, possibly turning wherever they really go. The upper level has tracks running from east to west and vice versa. Each incoming track splits into two tracks. On of them continues to the other side and only takes incoming connections. This is a collector. 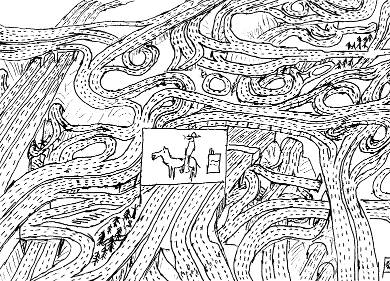 The other one only branches into curves connecting to the other tracks, called distributor. All tracks cross the field, using some space between different tracks. Whenever a collector and a distributor cross, the appropriate connection is present. After having crossed the whole field, for example from south to north, a distributor splits into two distributors going east and west until the last collector has been met. This allows for all possible connections in a fully grade free way and with no capacity constraints other than those imposed by the tracks leading and from the interchange. It needs very much space. And it is a theoretical construction, because in practice it seems to be sufficient to offer the most important connection in a grade free way. Real railroad interchanges are relatively compact, but the station or the yard that happens to be located at the interchange can be huge. In April 2013 an explosion happened in a fertilizer production plant in Texas which had huge impact. It looks like it was ammonium nitrate which exploded. This is used for producing fertilizer. But it is also quite explosive and can be used in pure form or mixed with other substances as explosive. The worst known accident with ammonium nitrate happened in 1921 in the Oppau-plant of BASF in Germany. For feeding the current earth population the nitrogen holding compounds that are generated by natural processes and become available to the plants are not sufficient. Therefore it is necessary to rely at least for part of the agriculture on chemical fertilizers, implying the need of production, transport and storage of these substances, of which ammonium nitrate is an important example. So it should be better to make the plant working with ammonium nitrate safer than to refrain from working with this substance. Fahrenheit is such an odd American unit like square foot, pound or gallon. Or even worse: cubic foot, who has three feet? Nobody needs this crap any more and we should all switch to the metric system. Habits take a generation or two for this, but it will come… So now it is the metric system we should all strive for and of course Celsius degrees instead of Fahrenheit. Physics classes become a lot easier… Freezing of water at 0°C, boiling at 100°C. And the intermediate range is divided evenly and the scale is extrapolated to the top and the bottom. Quite simple, right? Unfortunately not quite true. We have indeed introduced the metric system in most industrialized countries in many areas, but the temperatures have actually been excluded. The metric unit for temperature is Kelvin (K) and not °C. The next question is what an even subdivision of the temperature scale really means. Ok, the lines on the thermometer should have equal distances, but what liquid are we using for the thermometer? What is the melting point and boiling point of water? Even slight quantities of dissolved substances and the air pressure have quite significant influence on them. But this can all be described and the temperature scale is precise enough for practical purposes. But the real thing is Kelvin (K). If we are not using the metric system for temperatures anyway, we should ask, why. Everybody knows it: The Kelvin temperatures are clumsy and unintuitive. To some extent it is also just a matter of habit. Most measurement units that we encounter in our daily life are used in a wide range of magnitudes. Lengths can be millimeters and thousands of kilometers, which is all really part of our daily life, not just some lab stuff. Times can be seconds and years. Masses can be milligrams and tons. When talking about temperatures we like to know the temperature of water and air and how it feels, most of the time. The melting point of aluminum is by itself interesting and maybe even useful to know when doing a chemistry or physics exam, but for most of us it is not really part of our daily life. The freezing point of water can be of some interest, for example in order to know if it is possible to go swimming in a lake or if icy highways can be expected. But some other temperatures need to be considered interesting: Down to about 0°F it is still quite ok with moderate clothing to move around outside. For much lower temperatures serious equipment is needed or it is good to keep the time outside really very short. Our body temperature is near 100°F and temperatures up to this seem to be quite warm, but still bearable for a longer period of time for most of us. If it is warmer than that, it really gets way too hot for most of us. This is especially true for water temperatures. It is unlikely that a switch from Celsius to Fahrenheit will ever happen in any country. But from all these non-metric unit Fahrenheit is the one that I consider most reasonable, much better than Celsius. When working with temperatures in scientific context, especially in physical chemistry, the advantages of going all the way for metric units show up. Many formulas become much simpler when using Kelvin, not so much because of the scaling factor and more because of the fact that this ugly summand can be eliminated. So the theoretical max of the efficiency of a temperature powered engine is or the ideal gas formula is (intensive form) or (extensive form). The intensive form abstracts from the quantity by using the volume per mol instead of the volume. Actually I prefer that, because the extensive forms imply an integration over the volume and a homogeneity, while intensive quantities describe matter at one point or a small vicinity of one point, as long as we can still abstract from the granularity due to the molecules and atoms. Measurements like temperature and pressure start to make sense with certain large number of molecules. Or what is the pressure or temperature of a single molecule? , and are the temperatures in K, °C and °F, respectively.